Soldier Field, home of the Chicago Bears, has seen many huge concerts come through its gates since opening in 1924. From the late great Johnny Cash in 1964 and Stevie Ray Vaughn in 1983 to rock and roll legends such as Pink Floyd (1977, 1994), The Rolling Stones (1978, 1994, 1997, 2005, 2006), Paul McCartney (1990), Bruce Springsteen & The E Street Band (1985) and The Eagles (2010), the venue has been a prime stop for major concert tours over the years. The football stadium has also hosted concerts by the Dave Matthews Band (2000 & 2001), U2 (1997, 2009, 2011) and Pearl Jam (1995). Those bands and artists that have come through its doors are not just limited to rock and roll. Madonna (1987), ‘N Sync (2001) and Kenny Chesney (2008, 2009, 2012) have all played there as well. Soldier Field is located on the South Side of Chicago and was actually completely rebuilt in 2003. It now has the distinction of being the smallest and oldest operating stadium in the NFL. This summer, the venue will continue its tradition of hosting big name concerts. On the concert schedule as of today are Bon Jovi on July 12, the Legends of Summer tour featuring Justin Timberlake and Jay-Z on July 22 as well as Taylor Swift on August 10. Tickets for all concerts as well as all other events at Soldier Field this summer can be found right here at SeatGeek. 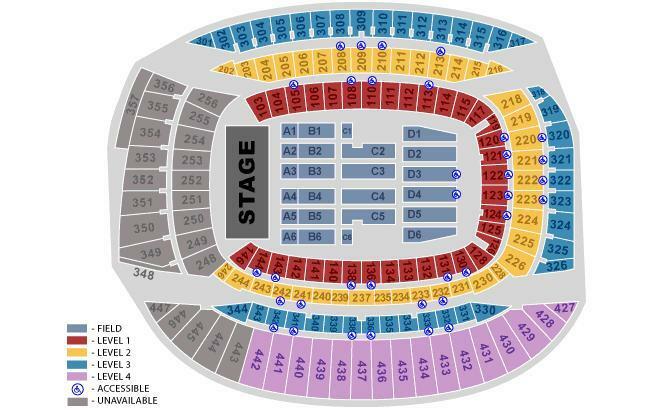 For a look at the seating chart for concerts at Soldier Field, check out the image below. The venue seats 61,500 patrons.